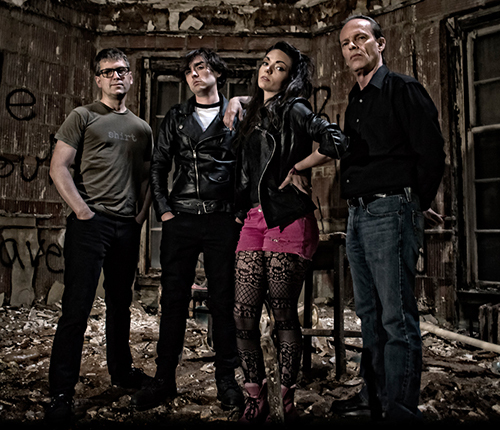 Hailing from Long Island, the band Bad Mary is currently gigging both on the Island and in the New York City area with their modern take on 70/80s UK/NYC Rock and Roll. Bad Mary’s line up is Amanda Mac (lead vocals), Mike Staub (bass/vocals), Bill Mac (drums) and David Henderson (guitar). Bad Mary was kind enough to answer a few questions via email. RiceburnerFM: How and when did Bad Mary form? What was the thought process behind your name? Bad Mary: We started as cover band doing college parties in 2009. David is a professor, so it was him plus a bunch of students. We had a different drummer and bass player then, and Mike played guitar. We did stuff like Paramore, Nirvana, Blink-182, Queen, Blondie, Lady Gaga, Even Michael Jackson and Toni Basil. We stayed together after half the band graduated, and pretty much did covers until 2011 – Rory, our drummer, got a gig at Disney in Florida, so she took off and was replaced by Bill, Amanda’s Dad. Then Andrew took off for the west-coast so Mike switched from guitar to bass and the current band was set. It was also around then we changed from being Madame-X to Bad Mary. Madame-X had already been used by a bunch of bands, so we had to ditch it. We still have some t-shirts and stickers and stuff! We talked about a new name for a LONG time and decide it had to have 4 major components, and these are vague, but it meant something – 1. Kinda humorous 2. Something female about it 3. Something “punk” about it 4. Easy to spell and easy to say. I (David) was sitting at a traffic light on my way to work and the name just came to me. I texted the band right away – woke them up I think. It took a day of mulling it over, but by that evening we knew it was right. RiceburnerFM: On your website you describe Bad Mary as being multigenerational, how has being from different musical eras impacted your music? Is there any generational rivalry? So the short answer is, there is no rivalry, but the multi-generational feel makes us better song writers. RiceburnerFM: Describe Bad Mary’s creative process, who does what and how does a song get made? Bad Mary: We basically write songs in two different ways – Mike and Amanda songs, and David songs. Mike will write a riff and play it for the band, we’ll work on it with no vocals for some time while Amanda and Mike come up with lyrics. Or, David writes music and lyrics and makes little rough records that he brings in. After that, with both these ways, we have the bones of the song and then it goes into the Bad Mary mixer and who knows who’s contributing what at that point – we all have little ideas that get thrown in, what’s working, not working, changing bits here and there as we practice, Amanda makes the lyrics scan better and Bill throws everything he’s got at it. We usually then like to take the song out live a few times – Mr. Beery’s on Long Island is our favorite place to try out new songs – and then we’ll see how it goes over, see how it feels, and make more little tweets. Usually lay down a rough recording along the way so we can all refer back to it. Have any of these famous Long Island musicians influenced Bad Mary’s sound? Bad Mary: Hahaha, not really, to be honest. We mostly get our influence from UK and NY stuff from the 70s/80s – Blondie, Ramones, Clash, Damned, Misfits, Motorhead, Police; or 90s stuff – Green Day, Offspring. I’d say we’re probably way more influenced by the earlier stuff and I think you can hear it in our sound. RiceburnerFM: Talk about your transition from cover band to original music group, is it easier to get gigs as a cover band? Is there any difference in the audience that just wants to listen to popular covers and the music fans that crave original music? Bad Mary: So much easier to get gigs as a cover band – every bar and club wants covers. It can be frustrating actually. The only good thing in the transition is that you learn who your real fans are. When you play covers, no one really cares who you are, you’re just one more band doing “Should I Stay or Should I Go” – but when you start to do original stuff, yeah, attendance at shows drops, gig offers drop – until you start to get people who get to know your songs. Our first album came out in 2013, and we played a gig in 2014 and there was this one moment when we heard everyone singing our lyrics. It was pretty incredible, I couldn’t get the stupid grin off my face as I was playing. RiceburnerFM: Bad Mary’s band practice: all business or party time? Bad Mary: We’re pretty disciplined actually. We don’t have much time to practice – we try to practice every week, but it doesn’t always happen – so when we get together, yeah we’ll chat a little bit – but if practice is 2 hours, we’re usually playing for at least and hour 45 of that. Unless we need to discuss other business, like promotions or gigs or whatever. But yeah, it’s business – and coffee. RiceburnerFM: Being on Long Island gives you the major advantage of playing in New York City and sleeping in your own bed on the same night, what are the other advantages or disadvantages of being so close to a music mecca such as NYC? Bad Mary: Well the advantage is of course that there are so many great places to play. All sorts of venues from tiny clubs like the Lit lounge or Fat Baby, up through places like The Bowery Electric and Arlene’s Grocery, and then finally like Webster Hall, the Gramercy and the Highline Ballroom – which we’re playing on August 11th! The disadvantage is there are SO MANY bands! It’s hard to break through all the noise and make an impact – and combine that with the fact that there is always something going on, it’s hard to draw sometimes. Still, overall, it’s a positive, NYC was the original home of punk, so we feel at home here. RiceburnerFM: Bad Mary has had airplay in both the US and overseas (UK and Australia). In each case describe your reaction when you first heard that Bad Mary was on the air. Bad Mary: I remember the first time we were going to get internet airplay – thinking “This is it! Everyone is going to hear us!” and kind of freaking out when the DJ talked about the band and led into the song. Then realizing there are a million internet radio station out there all trying to be heard – but it was still cool. I think our first actual “terrestrial” air play was at a station in the UK – rivieraFM on the south coast. That was pretty great – you could stream it online so I was listening to the broadcast. This one DJ really like “Forget About It” from our first album and played it quite a bit. And we’ve been played a lot at a few college stations here in the US– Stony Brook and MIT mostly – we were even invited up to MIT for an on-air gig and interview, plus we got a gig at a dorm that night. The whole thing was a great experience. And then this guy in the middle of Australia plays our stuff A LOT on his station. It’s pretty awesome knowing people getting exposed to your stuff. RiceburnerFM: Amanda: Female performers in general and lady rockers in particular have always been both trailblazers and role models. Regardless of your political affiliation, what are your thoughts on the very likely possibility of America’s first female president being elected this year? Bad Mary: Amanda:Female performers are often seen as trailblazers because they are willingly given a platform in which to speak and express themselves. We need to have more of that. I think it would be a great step for our nation to have a female president, and I think it’s a very exciting time. I am so happy for young girls today who are growing up seeing that a woman can be nominated on a major party ticket, and that they’ll never have known a time when that hadn’t been the case. Girls can grow up now and have realistic dreams of being president, being a rock star, or even a Ghostbuster!! RiceburnerFM: 2016 is more than half over, so what are Bad Mary’s goals for 2017? Bad Mary: More gigs! And one or two new Eps! 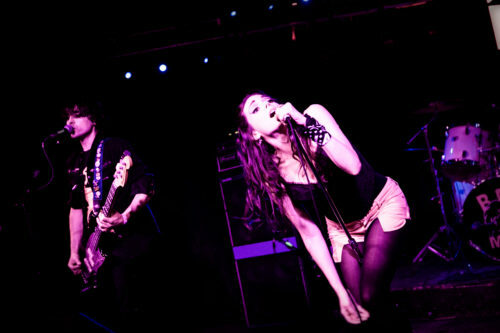 We want to get more festival and college gigs. We’ve got a few things in the works right now, but nothing confirmed so can’t spoil them. But we definitely have a new EP in the works, hopefully out in early 2017. RiceBurnerFM thanks the members of Bad Mary for taking the time to answer these questions. This entry was posted in Interviews and tagged 2016, Female Fronted, Long Island, new wave, pop-punk, punk, retro. Bookmark the permalink.